Hi! My name is Rafa Reyes, a student from Saint Mary’s College of California and currently studying in John Cabot University in Rome, Italy. 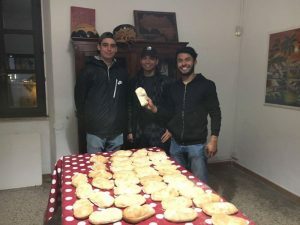 This blog post is about my volunteering experience in Rome, Italy working together with John Cabot University to serve unprivileged people around the city with our heartwarming smiles and unwavering kindness. For me, I choose to volunteer because I believe that in the world that we live in today, no matter where you come from and no matter what you have, there are people in the world that are suffering due to lack of access to basic needs. The opportunity to volunteer not only gives me the chance to give back to the community but also to create an impact strong enough that the people of the community will never forget and will cherish forever. In Rome, there are about 8,000 homeless people with the number growing by about 10% in recent years. Others have homes but need meals and social services, but most are not so lucky. Based on Italian national statistics, it shows that a third of people living in Italy risked poverty or social exclusion, compared to a European average of 24.8%. These are just mind-boggling statistics that we as citizens of the world need to think about. 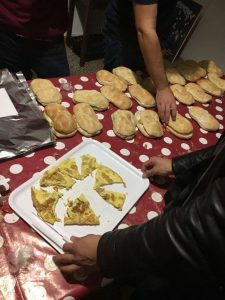 One of two sandwiches served for the people of Comunità di Sant Egidio. One of the sandwiches was packed with Eggs and Cheese while the other sandwich was packed with tomatoes and tuna. Throughout my volunteering experience in Rome, I have volunteered in two places that have gave me such an experience that I will never forget and have created relationships with people of the local community and learning about the things that they have experienced in their lives. 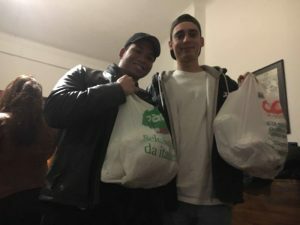 I would just like to say that the biggest highlight of my volunteering experience in Rome is the meeting of people of different backgrounds with different life experiences in the local community. I’ve never felt so grateful to meet these people because they have helped me develop a sense of pride and identity to the extent that it has helped me also develop a sense of purpose in my life. 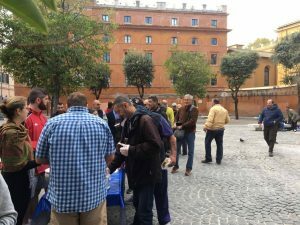 In Rome, I have volunteered in distributing food to the needy at La Ronda della Solidarietà and preparing and distributing food as well to the needy at the Comunità di Sant Egidio. Dillon Fitzmorris and Rafa Reyes posing for the camera; happy and ready to deliver sandwiches to the community of Sant Egidio. Originally from the Philippines, I have experienced first-hand what underprivileged people have gone through. I have worked with several organizations most notably, Gawad Kalinga, a poverty-alleviation foundation that works in rural and urban areas around the country building homes and communities “dedicated to eradicate poverty and restore human dignity”. The experience I had working with this organization sparked my interest in continuously helping out communities not just in the Philippines but all around the world. With my international experience of volunteering in the United States and Italy, I hope to bring my knowledge and skills that I have developed to the Philippines and help contribute to the eradication of poverty in my home country. 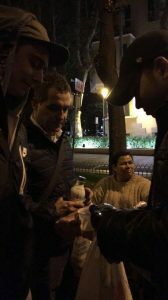 Dillon Fitzmorris and Rafa Reyes (shown above) pouring some hot tea for the woman; (shown in the middle) a member of the Sant Egidio Community. The Philippines has a worldwide reputation for having one of the most extreme poverty all over the world. Based on statistics, more than 26 million Filipinos remain poor with almost half, or a little more than 12 million, living in extreme poverty and lacking the mean to feed themselves. Just based on that, we can see that there are so many places around the world that needs help. The twin forces of technological change and globalization today are not only essential to making the world a digitalized world (making everything easier; from cashless services, autonomous transportation, etc) but also the backbone of humanity’s future economic growth. A work in progress, as some may call it, the world today continues to find ways to make it a better place. Metaphorically, the world is like a business in some ways. We invest ourselves to innovate and create solutions, we work to contribute in ways that can help eradicate issues, and we market and advertise to spread awareness in hopes that people will do the same. In places like Rome and the Philippines, the issue of poverty has long been an issue for as long as anyone can remember and our generation and future generations to come ultimately have the power to do something about it. With that, I believe that it is in our nature as humans to become socially aware and make change. The future looks promising, but we collectively (the world) need to help and make change. The beautiful community of people at La Ronda della Solidarietà lining up for food and drinks. Rafa is a Fall 2017 SAI Rome student from Saint Mary’s College of California.